Coastal Bangladesh is a hotspot for water insecurity. Salinity is a key issue in the dry season both for drinking water and irrigation. Coastal flooding is a major concern due to the lands subsiding behind poorly maintained embankments and potential dike failure. These problems are expected to worsen in the future. 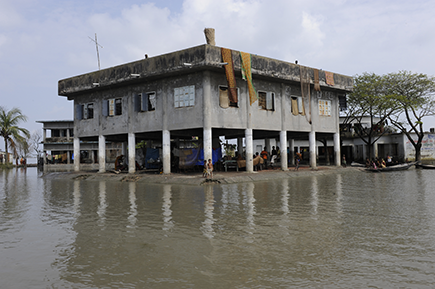 The Delta Dynamic Integrated Emulator Model (ΔDIEM) is designed to analyse links between climate and environmental changes, livelihoods, well-being and governance in coastal Bangladesh. It can test a large number of water-based interventions within a robust scenario framework, as well as quantify development trajectories and trade-offs. ΔDIEM is much more than a piece of software, as it promotes discussion and cross-sectoral cooperation of researchers, technical experts and decision-makers. The aim of this project is to update and improve ΔDIEM to better address water security. The model will be used to quantify water security, food security and well-being indicators of the coastal population under an uncertain future. This information will help the government make better decisions and develop targeted policies and regulations to help the most vulnerable. This project is one of twelve Catalyst Projects funded through our Partnership Funding.